My wife’s been playing FF6 on virtual console lately, and she just did the scene in Narshe after the three groups reunite, when Cyan discovers that Celes and Terra were imperial soldiers. At the end of the scene, Sabin steps forward and says the nonsense line “Oh, this is…” and then it just leaves off. What on earth does he say in the Japanese? Out of consideration of my brother, I ask that you pretend this never happened for now. Out of consideration of my brother, I ask that you set this aside for now. Out of consideration of my brother, I ask that you endure this for now. Out of consideration of my brother, I ask that you quell your anger for now. Or just anything generally along those lines. Basically, Mash/Matthew/Sabin is asking Cayenne/Cyan to calm down in a polite manner. I’m not sure how this became, “Oh, this is…” in the original translation, but since it sounds like the SNES translation was done with very little time to begin with, oddities like this are to be expected. Y’know, the more that I think about it, “Oh, this is…” sounds like the translation of an extremely common phrase in Japanese entertainment, to the point of almost being a cliche. So I wonder if maybe the SNES translation of this line was based off of an unfinished Japanese script, and then later on the Japanese script for this scene was updated. I could see that as another possibility too. The letter "D" mysteriously appears in this classic game's translation. What's going on? The English version of Final Fantasy VIII is filled with the phrase "whatever". What was the Japanese version like? Why... is... this... line... so... absolutely... slow...? I wonder how that line was translated in the GBA version. I’ve only played the GBA version of FFVI, but i think it has a great script to it. One of my favorite lines is in some town shortly after you get Cyan where some bar-wench hits on him, “I call this one ‘Humpty’ and this one ‘Dumpty’!” LOL. I always wondered how that line was in the SNES translation. Or the japanese version, for that matter. I think that’s a pretty good translation of the line, in my professional website-commenter opinion. Mato should add that screenshot to this post. Very interesting translation, there! But Woolsyisms are supposed to be good, not near incomprehensible . I don’t have a Japanese script dump handy for you, but from the English script, this line actually makes sense with the ones that come before it! He says it again at the end of the scene, actually; it’s the last line before dudes rush in to tell you Kefka has arrived. Interesting, makes me wonder if this double line usage is the result of a bug/human error of some sort. EDIT: Yeah, this particular, “Oh, this is…” comes just before the “the empire cometh” line at the end of the scene. Just from your article, I immediately thought the idea was, “Oh, this is annoying. Just calm down”. I’m not sure if that counts as “polite”, but it made sense to me. Still, it seems Woolsey altered the surrounding text, as well. 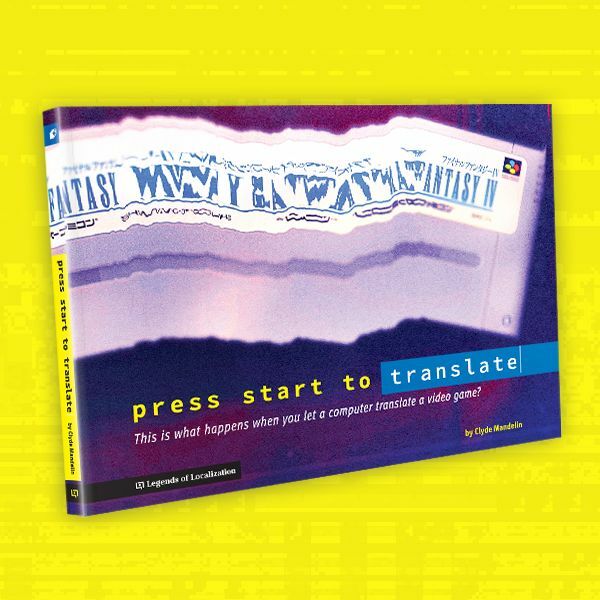 I hope a detailed go-through will often check the GBA translation by Tom (retran)Slattery. Awesome, thanks for looking that up! I already played up to when Setzer takes the party to the Empire’s continent, so I’m using a homemade tool to read the scripts of the GBA versions. Searching for the exact line was harder than I expected, but I believe (but am not certain) that Sabin says “I’m going to have to defer to my brother on this one…”. The GBA versions of the entire SNES trilogy in all regions use special variants of UTF-8 in which characters are profiled by how frequently they appear in the script, so that the 128 most frequent characters take exactly 1 byte each (and in Final Fantasy VI, the profiling for messages is independent of the profiling for menus and the music player), which means that I cannot refer to Unicode, Shift JIS, or EUC to search for a particular kanji. I was forced to locate the kanji 兄 manually so that I could search for text strings containing it. 兄 is code point U+016B, which appears as the byte sequence C5 AB. But the hardships do not stop there. Kanji must now be squeezed into squares that are 12 pixels tall, which means that 貴 looks slightly different. In addition, a new kanji, 免, not found in the SNES version was added, so I had to switch between hiragana and kanji to find the text string. The text string ID is 0x0368 in the GBA versions (in message bank as opposed to menu/music player bank, same text ID for all 3 regions). 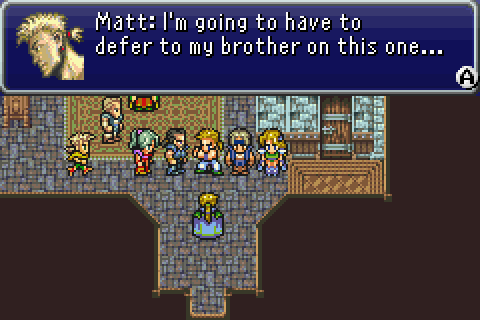 As a side note, Final Fantasy I+II: Dawn of Souls does not use the same text engine. It uses Shift JIS with no character profiling, and the North American version uses full-width characters even though glyphs of the half-width characters exist and could be used to save space. Cool, thanks for the technical info – that’s the stuff I always love to hear about! Interesting how the translation didn’t worry about space issues. I always wondered about this line myself. At least it makes more sense as to what Sabin was really trying to say. I imagine Secret of Mana was full of awkwardness like this too. Speaking of Squaresoft games from the glory days, I was wondering if perhaps you could compare Frog’s dialogue in the Japanese version of Chrono Trigger to his knightly speaking in the U.S. version. I heard from numerous folks that Frog was quite…foulmouthed in the original script and I’m curious to see how he addressed others originally. I haven’t played the Japanese version in more than a decade, but I don’t really remember anything particularly bad about his speech style. It might be a case of fan translators not handling harsh words well, similar to how the FF4 fan translation got handled. If you have any specific lines you can recall I can try to take a look though. Strange, I couldn’t find that article anywhere. But thank you for clearing the Frog thing up. Guess those folks must have been thinking of Frog being “foulmouthed” when he was talking to Magus and Ayla, not in general. I wonder if some of my other favorite nonhuman warriors talk like that, like Gray from Atelier Iris 2. I was about to ask about White Knight from Popolocrois because he says “de gozaru” in his sentences often, but you already pointed that out in the Frog article. So is “de gozaru” some super polite knight’s way of speaking? I guess you could call it that; nobody really uses it in real life, and you usually only encounter it in samurai-ish/knight-like stuff in entertainment anymore. I’m sure there’s some sort of etymology behind it, but I’ve never really looked too deep into it. If you’ve studied Japanese before, it’s basically like an archaic version of “desu”. Apparently, according to one FAQ writer, this is completely wrong. Daisy was supposed to say “Take care” to Donald and Goofy in response to Donald saying something else. Could you possibly shed some light on this one, when you have time? Sabin’s pose here always confused me too — it’s his “put ’em up” kind of preparing to fight pose. After reading your explanation, it occurs to me that probably they’re using it to stand in for some type of polite hands-clasped sort of bow. It’s also his spell casting pose, but you knew that already. As a kid, I interpreted that as a dismissive “Oh, this is (just great)”. I did a lot of “filling in the blanks” with FFII and FFIII when I played them, not even really noticing it so much, till I got older. Mash’s name is not a mistranslation of Matthew. It’s actually supposed to be his nickname in the Japanese version, his full name being Macias Rene Figaro. I’ve never really looked into it yet – is that the name shown at the end of the Japanese version? Or is it in a guide somewhere? It’s been so long since I last played the Japanese version that I barely remember anything anymore. Good question. The ending sequence gives his full name as “Mash Rene Figaro”, but every Japanese fansite, including the Wikipedia article. I’m assuming it’s an obscure trivia mentioned in one of the many FF6 guides released in Japan, if it’s not just a myth spread as fact. The name “Macias” is referenced in “Figaro no Kekkon: Tales From Desert,” a doujinshi by Kaori Tanaka, more famously known as Soraya Saga. She’s the person who created Figaro, Edgar, Sabin, and most of the lore surrounding their backstories. The reason you might have thought “Matthew” is that “Macias” is a poor romanization of “Matthias,” in much the same way that “Ceodore” is a misreading of “Theodore.” “Matt” would probably have been a better nickname… Or “Matth.” It’d be interesting to find out why it was changed to Sabin. I really got lost translating that line, mostly because I wasn’t especially familiar with that form of deference at the time. And his name, don’t even get me started on trying to translate THAT… Japanese is way too clever a language for its own good sometimes when it comes to coming up with plays on words. Aside from the limitations Woolsey had (time, Nintendo’s policy, etc. ), let’s no forget that communications between US and Japan weren’t as optimal as they are now (less worse than in the NES era), so maybe he couldn’t corroborate the actual meaning of this line, among other things. This is what I think.